Keep up with Cylance Pro Cycling's news from the peloton. The team shows the new kit in a training ride prior to the Santos Tour Down Under. Stabio, Switzerland (January 9, 2018) – Technical cycling apparel brand, ASSOS of Switzerland, announces today a partnership with the Cylance Pro Cycling Team. As part of ASSOS’ initiative to further support and promote women in cycling, the two-year sponsorship of the UCI Women’s World Tour Team will include custom apparel kits for all seasons. The commitment to Cylance Pro Cycling marks ASSOS’ first partnership with a women’s pro team. ASSOS will work closely alongside the Cylance Team to capture women’s specific product feedback in the ultimate setting and help drive ASSOS’ women’s product innovation. Australian Women’s Tour Down Under, wearing the Custom Aero Jersey and laalaLai Shorts. Additional team products will debut in February at Cylance’s team camp in Barcelona, followed by full summer and winter custom kits. to pro teams paying to wear ASSOS shorts during the Tour de France and to date, ASSOS is proud to have played a role in more than 350 gold medals at world championships and Olympic games. ASSOS works side by side with suppliers and gathers feedback from its internal test team to produce fabrics that offer optimum comfort for the rider. As a result of its continual investment in R&D the pioneering company is behind additional key innovations that have shaped the evolution of the cycling world and have now become industry standards. These include the first sublimation of a cycling jersey in 1980, the first elastic interface cycling short insert in 2001 and the creation of the fastest bodysuit on earth in 2004. Rossella Ratto (ITA) shows off the new 2018 jersey! Cylance Pro Cycling is entering its third year as a UCI Women’s World Tour team and continues to build on a strong foundation of success. The team will maintain its focus on the UCI Women’s World Tour calendar. Team Sports Director and General Manager, Manel Lacambra, is focused on continued growth from the team. Cylance Pro Cycling is proud to announce the addition of two-time World Champion and one of the winningest cyclists of all time, Giorgia Bronzini. The Italian sprinter is known for her ability to be successful on many types of terrain. She has the tenacity to finish on the top step even after some of the world’s most difficult races. 2018 will be a great year for her to use her experience and skill to continue to find success as well as contribute to the development of the team. Known as one of the most dominant American cyclists, Lauren Stephens (USA) is another notable addition to the 2018 roster. Stephens is known for her time trial strength and won this individual effort at Chrono Gatineau, Thüringen Ladies Tour and Tour Cycliste Féminin International de l'Ardèche. Stephens and Bronzini will be joined by additional riders, the previous Serbian National Champion, Jelena Eric, current Israeli National Champion, Omer Shapira, and a young promising American rider, Holly Breck. Breck (USA) has shown a great aptitude for racing, and has represented the USA National Team in Europe. Returning to the team is the recently crowned Spanish National Champion, Sheyla Gutierrez (ESP). Gutierrez has developed into one of the most consistent Spring Classics riders, and has also won a stage at the Giro and Le Samyn Dames. Joining Gutierrez will be previous Italian teammates, Rossella Ratto and Marta Tagliaferro. Ratto (ITA) is a previous World Championship bronze medalist and was on the podium at the Giro dell’Emilia. Tagliaferro (ITA) is a loyal teammate that will be a pivotal piece for the lead out in sprint finishes. Continuing with another year of multiple disciplines, Kaitie Keough (USA) will return to the team to race for Cannondale on both road and cyclocross. Already this year, Keough has victories on her Cannondale in cyclocross and enjoys the balance between the dirt and road for an ideal season. 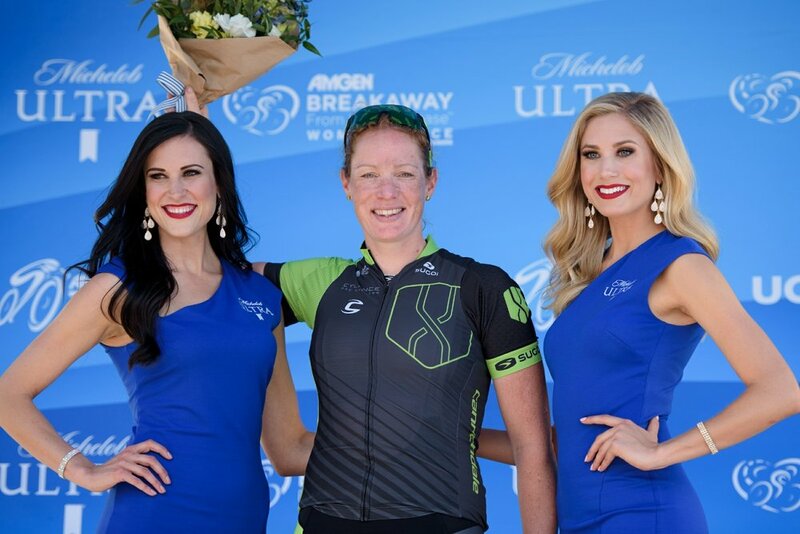 Keough will be joined by renowned climber, Krista Doebel-Hickok (USA) as she will continue her third year with Cylance Pro Cycling. Cylance Pro Cycling has retained a diverse and powerful roster for 2018. It is thanks to the support of incredible partners dedicated to the development of women’s cycling, such as Cylance Inc., that this next season will have global success and impact in the sport. Follow the team as they head towards 2018 at @CylanceCycling and cheer them on to #bringthegreen around the world and at races near year. Cylance Pro Cycling just completed North America’s hardest stage race, the Tour of Utah and are now headed to the Tour of Britain, a 2.HC eight-day stage race on the European Tour calendar. "Had a fantastic time at Tour of Utah, especially during the last stage. I got a little crazy out there, and it felt great! Really looking forward to bringing that attacking style over the pond to the OVO Energy Tour of Britain." Groove Ventures, LLC is proud to announce its partnership with the nation’s highest ranked cycling team, Cylance Pro Cycling. Cylance Pro Cycling is comprised of some of the best cyclists in the world, and represents athletes from 13 different countries. Cylance Pro Cycling is both a top women’s World Tour team competing globally, and one of the strongest men’s programs in North America. Groove Ventures is the creative force behind Groove Life, a breathable silicone ring created with the active person in mind. Cylance Pro Cycling will wear the innovative rings throughout the year as they race and train around the world. Cylance Pro Cycling stamped its presence again at the Giro Rosa with a commanding win of Stage 7 by Sheyla Gutiérrez (ESP). Sheyla crossed the line in full celebration showing her newly minted Spanish National Championship jersey. It was the seventh day of the ten day tour, and Cylance Pro Cycling already had achieved a 3rd place finish with Kirsten Wild (NED) in a fast sprint finish on the second stage. But yearning for more results, the team was determined to start the race aggressively, and the first Cylance Pro Cycling rider to establish a small break was Dani King (GBR). After many more attacks, the break of the day was established with eleven riders including two of the women in green represented with Sheyla and Rossella Ratto (ITA). With 5 kilometers remaining, it was clear that the break would stay away from the charging peloton. Rossella was determined to secure victory for her teammate, Sheyla, and pushed the pace into a fast leadout as Sheyla sprinted to the line in victory ahead of all others. This win added to the team’s success in the Women’s World Tour, and solidified Sheyla’s first World Tour win. The team looks to finish the Giro Rosa strongly and continue to find podiums worldwide. As the women conclude the grand tour, Giro Rosa, in Italy, the men of Cylance Pro Cycling head to Canada for BC Superweek before swinging back south into Idaho for the Andersen Banducci Twilight in Boise. BC Superweek is one of the most hotly contested series in North America due to the fast courses and large prize purses. It offers 9 races over a period of 10 days in the scenic British Columbia; in 2016 Cylance Pro Cycling riders found great success with three wins and two podium appearances between Scott Law (then with Subaru NSWIS Development Team) and Justin Williams. The Cylance Pro Cycling team will then travel back to the United States for the next stop on the USA Cycling Pro Road Tour, the Andersen Banducci Twilight Criterium in Boise, ID. This will be the first time the team attends Boise’s most prestigious cycling event. Stay tuned for more race updates as Cylance Pro Cycling races to #bringthegreen. Cylance Pro Cycling achieved its first National Champion of the year as Sheyla Gutiérrez wins the Spanish National Championships road race. It was an emotional win for Sheyla as she crossed the line for an emphatic win. Justin Williams is in Wisconsin with fellow teammates Scott Law and Orlando Garibay for the annual criterium series, Tour of America's Dairyland, for his final prep before nationals. With lots of cash primes on the line, the Tour of America's Dairyland, or ToAD as its called, features a very aggressive style of racing from the first lap to the last. Cylance Pro Cycling rider Justin Williams again assumes the top step in Uptown Minneapolis on stage four of the North Star Grand Prix behind a solid team effort. In 2016 Scott Law, then with Australian development team Subaru NSWIS, came agonizingly close to winning the overall jersey at Tulsa Tough, and he hasn’t forgotten about that moment since. Tulsa Tough is one of the premier events for the top sprinters on the North American calendar and is an important part of the Pro Road Tour. Scott still felt the burn from 2016 and was motivated to achieve victory at this prestigious event in 2017, representing Cylance Pro Cycling. Cylance Pro Cycling sent their top sprinters to Oklahoma early for the Oklahoma City Pro/Am race weekend as a tune up before the next round of the Pro Road Tour, the St. Francis Tulsa Tough. Scott Law (AUS) and Justin Williams (USA) were the team’s lone representatives in OKC over three days of racing and made the most of their time together with Justin taking the victory on both the Day 1 and Day 3. Scott just missed the podium on Day 2, coming in fourth. It was a successful three days of racing for the dynamic sprinting duo. Cylance Pro Cycling achieved two additional World Tour podiums at the Amgen Breakaway from Heart Disease Women’s Race empowered by SRAM in the four days of racing. The team has totaled five World Tour podiums in nine days, including the resounding victory at the Tour of Chongming Island. The first stage of the Amgen Breakaway from Heart Disease Women’s Race empowered by SRAM takes the riders around the scenic Lake Tahoe before finishing up the steep incline of the Heavenly Ski Resort. Alison Tetrick (USA) animated the race early and often, finding herself in a solo breakaway leading into the second major climb. After she was caught, she continued to attack to keep the race fast and aggressive. Into the finish, Krista Doebel-Hickok, once again showed her climbing strengths with a 5th place finish up the slopes of the mountain. The queen stage was conquered on the second day of racing, as the women crested the first climb on Highway 89, which was 6.7 kilometers, within the first 15 kilometers of racing. The peloton sped down the descent into Diamond Valley with speeds excess of 100 kph. With echelons and attacks in the flats leading into the penultimate climb, the race was nervous and aggressive. Kirsten Wild (NED) won the intermediate sprint on the bottom slopes of Kingsbury Grade and set up Doebel-Hickok perfectly to tackle the 13 kilometer climb. The race shattered on the 40 minute effort as climber Doebel-Hickok crested the mountain in a very select group behind two additional riders. Teammates Dani King (GBR), Rossella Ratto (ITA), and Jasinska (POL) climbed strongly not far behind. Doebel-Hickok remained in her group over the climb to finish just behind the two leaders to take third on the stage. After two mountainous stages, the last two stages were ones for the sprinters. The team rallied around Kirsten Wild (NED) who is notably one of the best sprinters in the world. With one win and two podiums at the recent Tour of Chongming Island, Wild is in good form to win in any fast finish. Stage 3 began in Elk Grove and paralleled the Sacramento River as the race continued through the delta to finish at the Capitol Mall in downtown Sacramento The team controlled the race to set up Wild, but an unfortunate near crash caused Wild to require a bike change within the final kilometer, which took her out of contention for the sprint. With renewed focus for the final stage, the team once again, was ready to race for Wild in the finishing circuits. The final stage included 20 fast and technical laps around the state capitol of California. As predicted, the race was destined for a sprint finish. With excellent teamwork, Wild sprinted to a close third place result. This was the second podium for the team at the Amgen Breakaway from Heart Disease Women’s Race empowered by SRAM and the fifth World Tour podium in the month of May! The next race for women of Cylance Pro Cycling will be the next UCI Women’s World Tour event, the Aviva Women’s Tour, from June 7th-11th. Cheer on the women of Cylance Pro Cycling as they #bringthegreen to a race near you! Highlights from stage 4 of the Tour of California. Cylance Pro Cycling secured its first World Tour victory at the Tour of Chongming Island as Kirsten Wild (NED) sprinted for the win on Stage 1 after a chaotic day on the road. Wild then finished 2nd on both Stages 2 and 3 to secure a second overall in general classification. It was an impressive performance by the Dutch sprinter recently returning from the UCI Track World Championships with two medals. Cylance Pro Cycling is heading to the next UCI Women’s World Tour race, the Tour of Chongming Island. Located outside of Shanghai, Chongming Island is an oasis of greenery and a great backdrop for fast world class bike racing. The Tour of Chongming consists of three days relatively flat and furious days that are typically dictated to finish in a sprint. The men of Cylance Pro Cycling will race the Redlands Bicycle Classic. After a podium sweep at the Dana Point Grand Prix, the team will compete at this next Pro Road Tour event looking for continued victories. Cylance Pro Cycling sets a standard of teamwork and victory at the Dana Point Grand Prix with an impressive 1,2,3 podium sweep. In its 11th year, the Dana Point Grand Prix is the next stop on the Pro Road Tour, and the men of Cylance Pro Cycling were ready to put on a show. Cylance Pro Cycling announced today its participation in the “Hardest Stage Race in America”, the Larry H, Miller Tour of Utah from July 31 to August 6. The Larry H. Miller Tour of Utah is a 7 day stage race that crosses the entire state with notoriously difficult mountain ascents and high elevation. The Larry H. Miller Tour of Utah began in 2004 and is one of five UCI sanctioned multi-stage cycling events in North America. In this year’s edition, the race will begin in Logan and conclude in Salt Lake City. The event will navigate around the state of Utah making stops in Layton, Snowbasin Resort, and Bountiful. The 2017 additions to the race include new host cities that have not been a part of the race in the past, including Brigham CIty, Big Cottonwood Canyon, South Jordan, and Layton. In addition to new stops along the way, the individual time trial has returned to the event and will climb Big Cottonwood Canyon on the third stage. “Its an honor to have our team invited to the Larry H. Miller Tour of Utah and it feels like a bit of recognition for all of the effort the team has put into making 2017 a special season for us,” added Director Sportif, Hilton Clarke. Cylance Pro Cycling will be motivated to animate this iconic race and is proud to be included in the selected teams to compete. Stay tuned for the roster announcement and the team’s preparation as they #bringthegreen to the Larry H. Miller Tour of Utah in 2017! Cylance Pro Cycling Rider Rachele Barbieri Wins World Championship, Kirsten Wild Earns Two Medals in Hong Kong! Cylance Pro Cycling won three medals at the UCI Track World Championships with Rachele Barbieri (ITA) being crowned a World Champion and Kirsten Wild (NED) winning a silver and a bronze medal. The UCI Track World Championships took place in Hong Kong as the riders represented their individual countries on their national teams in multiple events. After finding success on the road with Cylance Pro Cycling, Barbieri and Wild began their focused training in preparation for the World Championships by attending World Cup track races around the world. Riding multiple disciplines can be challenging, but Cylance Pro Cycling believes in supporting the riders’ individual goals throughout the year. Cylance Pro Cycling is headed to one of North America’s most difficult stage races, the Tour of the Gila. Located in Silver City, New Mexico racing from April 19 to April 23. Taking place in high desert altitude, the race is notorious for its five days of windy and mountainous conditions. The 2017 Tour of the Gila is a part of the Pro Road Tour and Cylance Pro Cycling is sending both women’s and men’s teams to compete in the event. Cylance Pro Cycling has reached the turning point from the cobbled classics to enter the hills of Ardennes Week. The first race that marks this transition in the season is the Amstel Gold Race. Even though Amstel Gold takes place in the Netherlands, and it is not geographically within the Ardennes, it is still regarded as the beginning of Ardennes Week. The races that follow are Liege-Bastogne-Liege and Flèche-Wallone. All three of these races are a part of the UCI Women’s World Tour calendar. Although Flèche-Wallone has had a women’s race for many years, Amstel Gold Race has not had a women’s edition since 2003 and this is the first edition of the women’s event for Liege-Bastogne-Liege.